Here is the first part of my 50th CIFF report card, including the best films I saw at the fest — with ratings of 7.5 or higher — and featuring four new capsule reviews (of Winter Sleep, Clouds of Sils Maria, Of Horses and Men and It Follows). Part two, detailing films rated 7.4 or lower, will follow next week. Timbuktu (Sissako, Mauritania/Mali) – Rating: 9.5. Review here. The Babadook (Kent, Australia) – Rating: 9.2. Review here. Nuri Bilge Ceylan follows up his 2011 masterpiece Once Upon a Time in Anatolia with this impressive near-companion piece, a Chekhovian chamber drama that focuses on dialogue-driven interior scenes as much as the earlier movie did on its majestically filmed journey through the barren Turkish landscape at night. The central figure here is Aydin (Haluk Bilginer), a retired, middle-aged actor who runs a hotel in rural Anatolia with his pretty young wife, Nihal (Melisa Sözen), and his combative, recently divorced sister, Necla (Demet Akbag). The verbal sparring with which Aydin frequently engages both women serves to mask the disappointment he feels with himself over his inability to start his long-cherished dream project of writing a non-fiction account of the history of the Turkish theater. While some critics have complained that this year’s Jane Campion-led Cannes jury was only recognizing the longest film and not the best by bestowing Ceylan with the Palme d’Or, this does a disservice to his achievement; Winter Sleep does indeed require each one of its three hours and 16 minutes in order to fully illustrate Aydin’s predicament in both its tragedy and ridiculousness (the film is at times surprisingly funny), and no contemporary director has a better compositional eye than Ceylan, who was a professional photographer before he turned to filmmaking. Perhaps not as formally perfect as Once Upon a Time in Anatolia, this is nonetheless a spellbinding experience–masterfully written, directed and performed. This backstage drama, written and directed by Olivier Assayas based on an idea pitched to him by lead actress Juliette Binoche, comes frustratingly close to being the best thing the French director has ever done. Binoche channels her inner Gena Rowlands (and even dons oversized sunglasses in one scene) in her portrayal of legendary theatrical actress Maria Enders — an aging diva who returns to the play that made her famous 20 years earlier, only this time in a supporting part to up-and-coming star Jo-Ann Ellis (Chloe Grace Moretz). One expects Binoche to be phenomenal — and she is — so the real revelation here is Kristen Stewart as Valentine, Enders’s fiercely loyal personal assistant. The scenes of these two women running lines for the play, in between bouts of debating life, art and culture, crackle with an electrifying female energy, with Stewart fully holding her own against Binoche every step of the way. But Clouds of Sils Maria is also flawed by being overstuffed with ideas; in addition to making nods to All About Eve, Persona and Opening Night, Assaysas wants to send up tabloid-celebrity culture, and the scenes with Moretz are unfortunately pitched at a level of cartoonishness that doesn’t quite jive with the rest of the film. This is essential viewing but I can’t help but wonder what might have been with a more streamlined narrative, one in which Jo-Ann Ellis never appears onscreen. The Iron Ministry (Sniadecki, USA/China) – Rating: 8.4. Review here. One of the unexpected gems of this year’s CIFF is this highly original comedy/drama about the relationships between horses and their owners in rural Iceland. 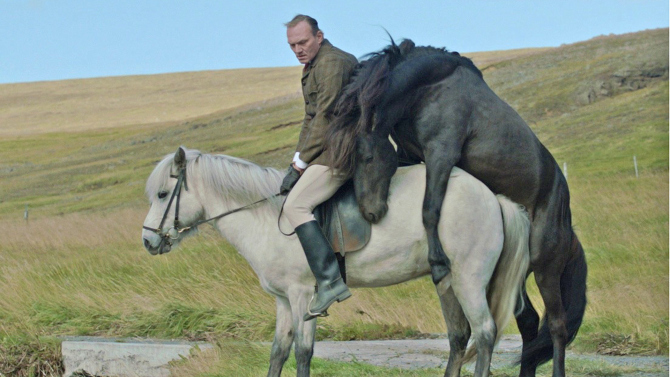 The lives of several characters are slyly interwoven, chief among them a man (Ingvar Eggert Sigurðsson) who is mortified when his neighbors witness a stallion mounting his mare while he is still riding her. Each of the film’s episodes playfully begins with a shot of a human reflected in a horse’s eye in extreme close-up, a conceit that underscores the idea that these horses are silent witnesses to the folly of their stupid human owners. In other words, this is a lot like an absurdist-comedy version of Robert Bresson’s Au Hasard Balthazar. Gorgeously photographed and featuring a rousing score, Of Horses and Men marks first-time writer/director Benedikt Erlingsson as a talent to watch. Miss Julie (Ullmann, Norway/Ireland) – Rating: 8.0. Review here. A high-school girl, Jay Height (Maika Monroe), sleeps with a young man she barely knows and soon finds herself being followed by a mysterious entity that takes the form of a succession of creepy strangers. Jay soon learns that she’s contracted a kind of sexually transmitted disease that will kill her unless she passes it on to another unsuspecting victim. David Robert Mitchell’s impressive fright fest has been making waves since its Cannes debut and, while I don’t think it’s a masterpiece on the order of The Babadook, it is exceedingly refreshing to see a new horror film that conjures a sense of dread primarily from its intelligent mise-en-scene: the use of sinuous tracking shots and zooms combines with depth-staging, a pounding, John Carpenter-esque synth score and Expressionist lighting (the climactic swimming-pool-at-night scene is straight out of Cat People) to create a potent big screen horror movie experience. While I don’t think writer/director David Robert Mitchell quite “sticks the landing” (the film doesn’t so much conclude as abruptly stop) genre aficionados can’t afford to pass this up. Baby Mary (Swanberg, USA) – Review here. This entry was posted on Monday, October 27th, 2014 at 7:47 am	and tagged with Benedikt Erlingsson, Clouds of Sils Maria, David Robert Mitchell, It Follows, Nuri Bilge Ceylan, Of Horses and Men, Olivier Assayas, Winter Sleep and posted in Film Festivals, Film Reviews. You can follow any responses to this entry through the RSS 2.0 feed. It’s great that you gave a horror flick such a high rating! I can’t wait until it comes out on BluRay/DVD so that we can show it to our friends! Are you referring to THE BABADOOK or IT FOLLOWS? I would love to revisit IT FOLLOWS on Blu-ray but I want to see THE BABADOOK again on the big screen. Do any of the horses die in OF HORSES AND MEN? Two horses die in OF HORSES AND MEN (one onscreen, one offscreen). A closing title states that no horses were harmed in the making of the film and that all of the actors are themselves horse owners. The horse deaths were, however, clearly disturbing to some members of the audience. Damn. This is playing at a tiny film fest here in Sarasota next week. I was going to go to this one but animal deaths are too disturbing for me.